Clean Up City of St. Augustine, Florida: RAWLS Admits to WUFT That His Goal is "Disruption"
RAWLS Admits to WUFT That His Goal is "Disruption"
1. "Rev." RONALD RAWLS, JR. is a racist who contributed nothing to the Confederal Monument Contextualization Advisory Committee. His goal -- disruption. He's a phony. 2. Sounds like bilateral symbiotic snowflakes -- people who hate the Confederate monuments and want them removed and people who defend them and shriek at the words "white supremacist" being used to contextualize them. 3. Both need to promote healing and stop being heels. 4. As Burke Marshall once said, "Blessed are the peacemakers, for they shall catch hell from both sides." 5. Here's a revealing article establishing the racist Rev. RAWLS' goal is "disruption." Ipse dixit, he can't fix it. From WUFT in Gainesville. A group of protesters in St. Augustine marched for the removal of an obelisk honoring the Confederate cause. The July 4 protest near the city’s bayfront also featured a call to the University of Florida as part of the protesters’ chants. “The whole idea was disruption, and I think anyone who saw it would agree,” Rev. Ron Rawls, the 51-year-old leader of St. Paul AME Church, said. 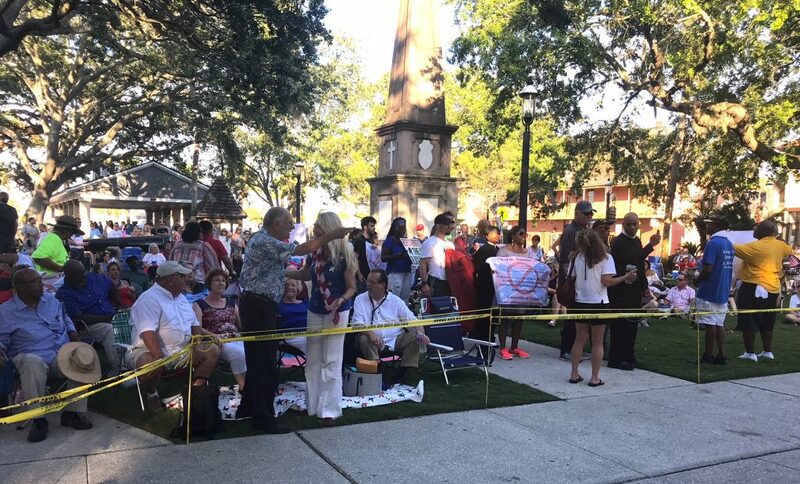 He led a crowd of about 25 people through the city’s bayfront with flyers and chants, asking for the removal of the obelisk in the Plaza de la Constitucion — a state-owned property governed by the University of Florida’s Historic St. Augustine Board. Thomas Bryant III has lived in the city for twenty years. “This issue is around the Confederacy, and the lack of compassion or consideration of what it means to the black community and what it represents,” the 61-year-old Bryant said. About a month ago, the board voted unanimously to keep the memorial, which also includes the ashes of Confederate Gen. William Loring. St. Augustine Tea Party media chairman David Heimbold said Rawls just wanted to stir up trouble. 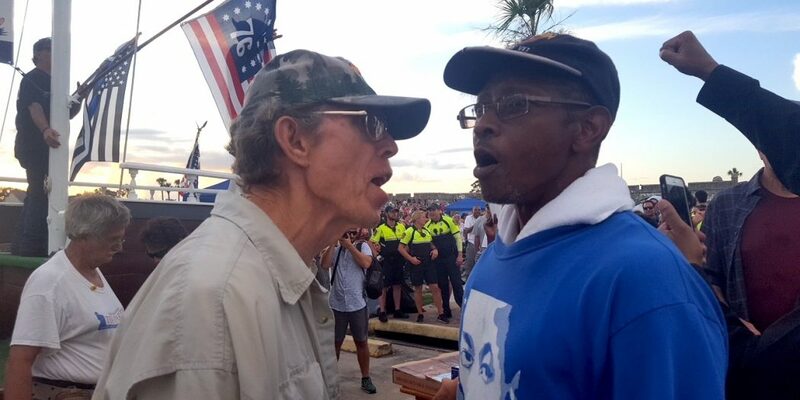 “Ron Rawls is a race baiter, OK? 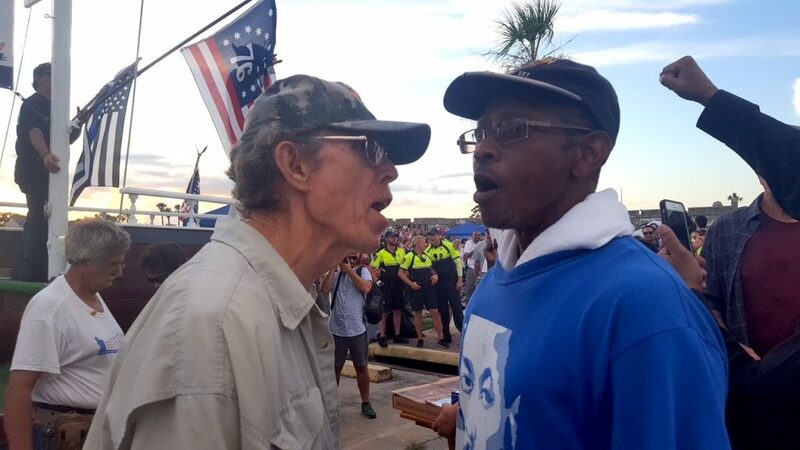 A race baiter, and he is stirring up a lot of poop with a very small amount of people,” Heimbold, 78, said. Protester Nicole Sparrow, 31, brought her 6-year-old daughter out to march. She said she believes her very existence is in jeoprady, and it’s not as simple as all people coming together. “It’s important that I show my children what the issues are that I’m going through, because in the near future, they will have to do this same type of organization and this same type of marching to get the same type of justices served for their communities,” she said. Some people cheered them and asked questions and accepted the flyers demanding the city and UF board reconsider their decision to allow the marker to remain.